Type-1 diabetes, also known as Juvenile diabetes or insulin-dependent diabetes, is often hereditary but also occurs when the pancreas stops working, which can be caused by another illness that triggers the auto-immune destruction of the insulin-producing cells in the pancreas. It is not like Type-2 diabetes which is caused by poor lifestyle and can easily be treated or reversed if caught in time. It is a myth that a type-1 diabetic can live a normal and healthy life, just like everyone else. It is not just a matter of taking insulin injections, monitoring blood glucose levels, eating properly and exercising. Blood sugar levels can rise and fall for no apparent reason, leading to hypoglycaemia (hypo’s, or low blood sugar) or hyperglycaemia (hyper’s, or high blood sugar). A diabetic can do exactly the same thing every day; eat exactly the same foods, do exactly the same type of exercise and the readings can differ by 10 points at the same time each day. Illness and stress can drive blood sugar levels up very high, and too much exercise can cause them to drop too low. Conversely, a lot of exercise can also stress the body and cause a hyper. It is extremely unpredictable. The endocrinologists that I have seen cannot assure me that anything about diabetes is logical. They also cannot assure me that I won’t die from a hypo. Up to ten years ago, porcine or bovine insulin was used. During that time, diabetics had a good twenty minute warning that a hypo was coming on; symptoms would be shaking, heart racing, a feeling of dizziness or weakness, and we had enough time to treat the hypo before it became dangerous. Now, with the new insulin, there can be as few as 2 minutes warning that a hypo is happening. Hypo’s can happen during the day, or during the night. If at night, a diabetic usually wakes up due to the shaking as the body goes into shock. But sometimes, we don’t wake up. Most people can feel hypo’s coming on and have enough time to treat them. But many other people don’t get any warning signs, and as a person gets older, the warning signs become less obvious. A blood glucose reading of 3 or less indicates a hypo, and at that stage your body has already started to go into shock due to lack of sugar. The human brain can’t function without sugar, and so it tells the rest of the body to stop working, as a self-defence mechanism. So the body literally starts to shut its components down. The heart will start beating rapidly, in an effort to pump blood through the body. Eventually the tongue goes numb and the throat starts to close up. If untreated, the diabetic will go into a coma and die. When the insulin was changed from porcine to synthetic, many people died from hypo’s. There is an emergency injection a diabetic can give to stimulate the liver to release any stored glucose, but it is not guaranteed to work. It makes you throw up, which kind of defeats the purpose of eating sugar to reverse the hypo. One can’t die from a hyper. However, it is incredibly painful. The body senses that there is too much sugar in the system and tries to eradicate it. It drains all the sugar from the internal organs, and then the muscles, filtering it through the kidneys, forcing frequent urination. Very quickly, dehydration sets in and the body starts to lose its mobility. Muscles become stiff and very painful. This can be treated with an injection; however an extra dose of insulin can bring on a hypo later in the day. There is no blood glucose monitor available that monitors the blood 24/7; therefore diabetics have to test their own blood as many times a day as they think they need to. This is of course, not possible at night unless you set an alarm to wake you up every hour so you can do a test, which is not ideal. A blood glucose meter that worked continuously, 24/7 with an alarm when glucose goes down below a certain level would bring diabetics peace of mind, and save lives. Nocturnal hypos are serious that a website has been created about them, called ‘dead in bed’. For most people a test before and after meals is the usual method, but I have to test in-between as well. When I do have a hypo, it takes a very long time to treat. The longest time I have had to endure a hypo was four hours, during which I drank lemonade, and ate sugar, non-stop till my blood glucose finally began to rise. It was a terrifying ordeal. I truly thought I was going to die that night. Thus, I live in a constant state of fear. One day, my blood sugar will be high, and the same time the next day, for no reason whatsoever, it will be low. If I go for a walk, my readings can drop by 10 points – which can be catastrophic. When I was younger, I was able to do arduous, challenging and long walks without any worries. If I had a hypo, I’d eat a handful of jelly beans, and the blood sugar would return to a normal level and I could continue my activity. But these days, there is absolutely no rhyme or reason for it to drop and I dare not do too much exercise. It is not a disease that can be easily managed at all. I live in a state of constant fear of hypo, and therefore I have to let my blood glucose levels stay higher than ideal, to prevent death from hypo. 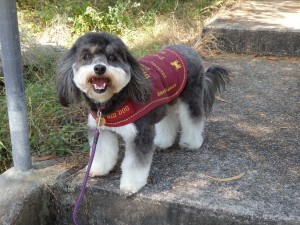 As a result of the hypo’s I was having I contacted Disability Aid Dogs Australia to apply for a diabetic alert dog. They were more than happy to help. Due to my experience of living with wild dingoes, I passed all their dog-training courses very quickly. I was able to get my dog Kari, who I rescued from a shelter, and began training her. She first detected a hypo when she was only 4 months old, and subsequently saved my life numerous times especially during nocturnal hypo events when she realised I could not wake up to treat them. The first two times she barked in my ear and pulled at my pj’s. The third time she could not rouse me, so she went and found my Dad and started barking so he knew something was wrong. During the day, if Kari knows a hypo is coming on, she tries to alert me by pulling at my ankles. If I don’t take notice, she goes to my bag and retrieves my testing kit. I have trained her to bring my phone and my sugar if I need it as well. One morning at church, I had a hypo but hadn’t felt it coming on. I was in the back row, and everyone was standing up singing the hymn; ‘God will take care of you’. I found the theme of the hymn slightly ironic and even amusing, as I lay on the ground going into shock. Kari started barking furiously and tried to pull the sugar out of my bag. It wasn’t until the hymn stopped and everyone broke for morning tea that they saw me on the floor and the contents of my bag strewn everywhere, Kari almost frantic in her efforts to get some help for me. Some parishioners said: ‘We thought it was unusual for Kari to misbehave so badly… but she wasn’t misbehaving at all!’ Needless to say, every time I am in church now, if Kari barks, everyone looks my way. When driving I always load up on sugar to make sure I don’t have a hypo. There has only been one occasion, fortunately, in 25 years that I’ve had a hypo while driving. Kari was in the car, and began barking furiously from the back seat. I pulled over and tested my sugar, and sure enough it was very low. I can’t put my life entirely in her hands; I still have to be vigilant and test my sugar at least 8-10 times a day. Yes, the finger prick tests hurt; no, you don’t get used to them. Most people assume the injections don’t hurt these days because the needles are so fine, but they do hurt. Hitting a nerve in my stomach can double me over in pain, and the injection sites are bruised and lumpy from scar tissue. As a diabetic you look normal and act normal. It is not apparent that you have this diabolical disorder that can make you feel nauseous, tired, make your muscles ache, cause depression, disrupt brain function, and many other things. Long-term complications are cardiovascular disease, stroke, loss of sensation in extremities sometimes resulting in amputation, loss of eyesight, and death. My eyes are now compromised, my feet and legs are going numb, I can’s always walk, my kidneys are compromised, and my arms and hands as well. When a diabetic is having a hypo, they can appear drunk. So it is necessary for me to have Kari by my side, so that if I do hypo and fall down, people will know that it is caused by the diabetes, due to the wording on her cape. People often ask ‘why do you need a dog for diabetes?’, because they don’t understand how dangerous the disease can be. Once I explain what Kari has done for me, they are immediately fascinated and empathetic. It also gives other diabetics the opportunity to tell me about their disease management, which in many cases is as crazy and unpredictable as mine. Kari is well known around town in the local shops, and is loved by the Cooloola Woolworth’s supermarket management and staff. She is a wonderful asset to Disability Aid Dogs. I feel much safer having her beside me. Every day is a skirmish, but every day I at least have something to be grateful for. My dog is always by my side, taking in every subtle change in my body language, mood, or scent, which tell her that I need her help. Disability Aid Dogs save lives . Kari holds class B & D licences. 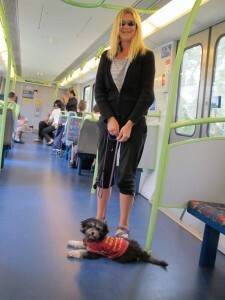 I hold a Certificate 5 Master’s Dog Trainer Certification, with Honours. B: High Demand Assistance Dog: Are the highly trained dogs that can enter supermarkets and all places that “Guide Dogs” can access. Although some discrimination still exists, it is widely accepted that these dogs are legal and therefore rarely pose the disabled handler problems in entering any areas that the public can enter. Please Note: A “Public Access Test” is compulsory for ALL levels, including a Home Therapy Dog, to test for stability and unwanted aggression. All HIGH DEMAND DAD Teams are tested at a high level of stability and food rejection, most especially, other ‘working dogs’ the working team may come into contact with. C: Alternative Handler: An “Alternative Handler” is generally a carer of a profoundly disabled person or child, who cannot handle a dog in their own right, so the carer is trained with the dog to alert if the disabled person they care for is in trouble. Frequently, such handlers are parents that are very ‘House Bound’ and cannot enjoy a relatively normal life. These dogs are trained with the handler to “Assist” in accessing goods and services including medical services and hospitals. This category also deals with the Autistic in some areas, young severe diabetics and epileptics. This is even a higher standard, where, under normal circumstances, a “Working Team” must have completed a MINIMUM of 12 months after final graduation as a high demand Assistance Dog (B). 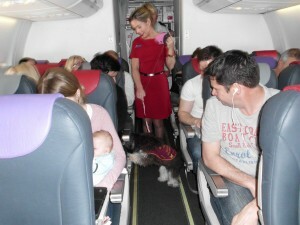 This standard is the highest standard for any Assistance Dog worldwide. Who knew diabetes was so difficult to manage? It should be called Diabolical. I have a sister with epilepsy, would one of your dogs be able to help her? Recently while at a shopping centre redeeming a gift voucher, I was trying on clothes. I left Kari in the change room while I went to get another size. 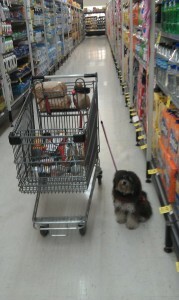 She began barking, and at first I thought that she was being naughty. I should have know better. When I went back into the change room, she pulled my testing kit out of my hand bag and gave it to me. While I was doing the test, she retrieved some sugar for me. Sure enough, my reading was very low. What a brilliant dog she is!